Made with a 55% hemp, 45% cotton blend, this medium weight woven pants is ideal for yoga and other relaxing activities. 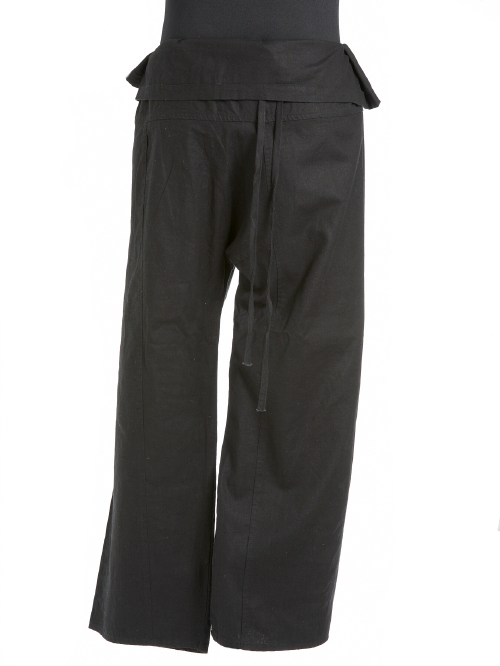 Its casual fit is comfortable and one size fits all.Thai Fisherman’s Pants are very popular with Yoga and Yoga Instructor and are often used as a standard uniform for Yoga Classes. Our Thai Fisherman’s Pants are designed based on the traditional Thai ethnic clothing of the fishing villages of Southern Thailand.They are great for traveling in and many martial arts schools find that Thai Fisherman’s Pants are excellent for work outs and exercise routines during martial arts study. The flexible size of Thai Fisherman’s Pants make them perfect for maternity pregnancy wear.They are perfect wear for meditation,massage or any relaxing pastime.